ITS Engineering College, Gr Noida Organizes first of its kind 'Model United Nations' Conference! ITS Engineering College, Gr Noida Organizes first of its kind ‘Model United Nations’ Conference! 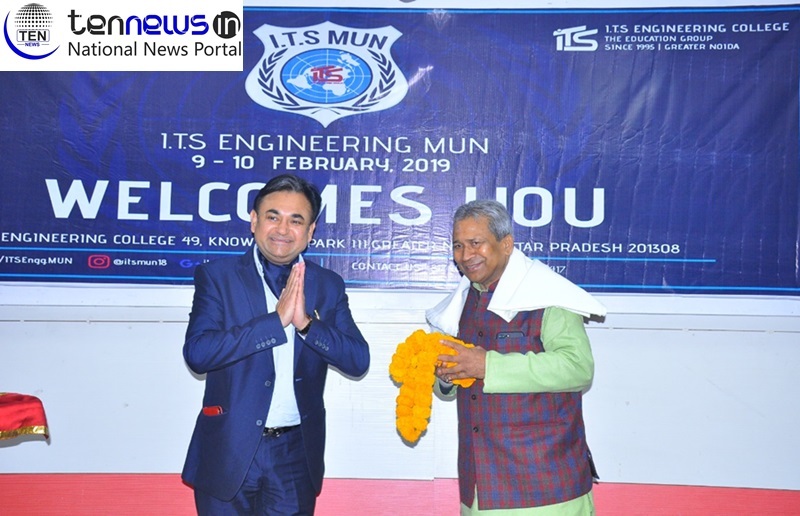 Greater Noida (09/02/2019) : ITS Engineering College, known for its new endeavors and its technique of teachings, organised an innovative MUN on Saturday. The primary focus of this exercise is to develop new learning techniques, to improve articulate thinking and to inculcate team spirits among the learners. The two day Model United Nations (MUN) conference begin from today in Greater Noida. This MUN is a first of its kind in this region, despite the fact that Greater Noida is a hub of educational institutions. Around 60 students from different cities and different colleges of the Delhi NCR region are participating in this MUN. Virendra Kumar Chaudhary, MP of BJP from Jhansarpur, Bihar, was present as the chief guest to grace the event. In his inaugural speech he welcomed all the participants from different cities as well as different colleges of region. He also wished everyone with luck for their conference and for their future life. He also said that BJP Government is working with complete responsibility and eagerness to increase the efficiency of the education in India. He also emphasized on doing more such events to engage students and to showcase their capabilities. Dr. Vikas Singh, Executive Director, ITS Engineering College, while talking to Ten News said “through this conference, students get a platform to present their views which they should use well. On this occasion, the enthusiasm of the participant is overwhelming. To make this conference successful, the entire team of the organizing committee of the ITS Engineering College has worked hard since the last few days”. He also said that “MUN’s are the platform where participants from different cities or even countries have a chance to showcase their ideologies and their talents in different dimensions of the world”. Students of ITS College were equally involved and responsible for the organization of this MUN. Students themselves arranged the participants and organized this event. Rajat Bhalla, a student of ITS and Secretary General for the MUN while talking to Ten News said, “that this has been a dream for me to organize such event in our college and I thank our faculties to believe in this idea and let us do the job”. He told us that “this MUN consist of 3 committees and International Press. These three committees are All India Political Party Meet, LGBT Committee and UNGA Committee for cyber offence and cybercrimes. The main objectives of these committees is to debate on various topics and how to get a solution on a point of conflict for the betterment of the community”.